Ageing is a natural and inevitable process of life, and it adversely affects the appearance of our skin, much to our chagrin. As we age, our skin cells renew at an increasingly slower rate, depriving our skin of oxygen and nutrients needed for a bright and even complexion. The skin also loses elasticity due to the depletion of elastin and collagen, and all these show themselves in the most intrusive ways – wrinkles, saggy skin, dull, uneven skin tone, and so on. But, there are measures we can take to look younger longer! What do anti-ageing facials offer? Anti-ageing treatments focus on strengthening and rejuvenating our skin from within to toughen its defence against the relentless current of ageing, exacerbated by the environmental effects of global warming and stress-filled unhealthy lifestyles. 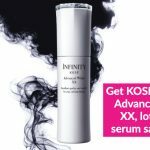 Advanced dermatological technology, high-grade active ingredients that deliver anti-ageing properties are what anti-ageing facials have in common, but they distinctly differ in their use of specific innovations and techniques and their uniquely tailored treatments. 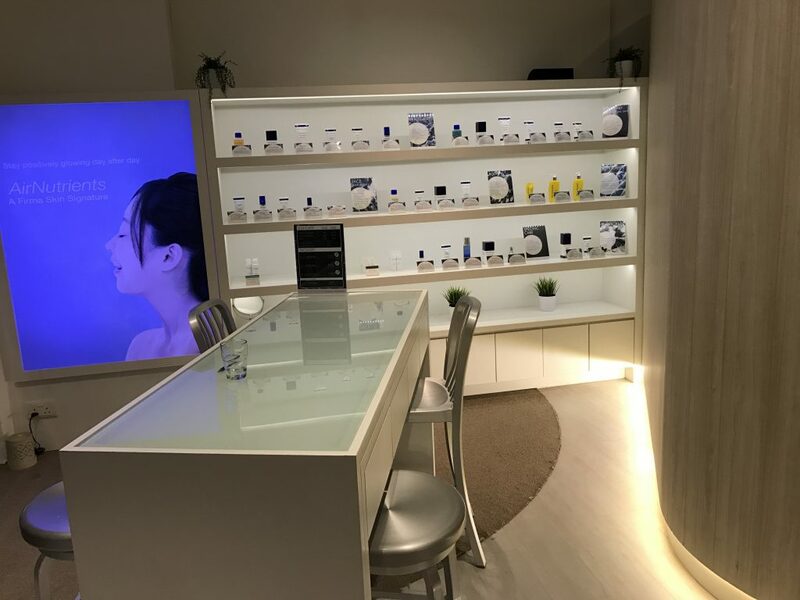 To save you the hassle of going through a whole internet of anti-ageing facials in Singapore and still having to test them yourself, we have personally experienced nine excellent ones and loved the results so much we decided to share our reviews with you so you can check them out too. 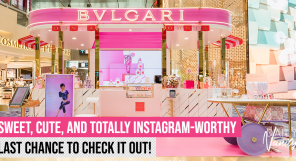 Located conveniently at Orchard Gateway level 3, Porcelain Aesthetics is easily accessible. Porcelain was founded by mother-daughter duo Jenny and Pauline, who currently have three branches and 12 products under its name. With more than 20 years of expertise, you can trust that their ProIonic treatment would pamper you and help you achieve that enviable V-line and radiance that you desire. An award-winning line-reducing facial, this treatment is perfect to help prevent the appearance of signs of ageing and fighting existing ones. How is the anti-ageing facial done at Porcelain Aesthetics? 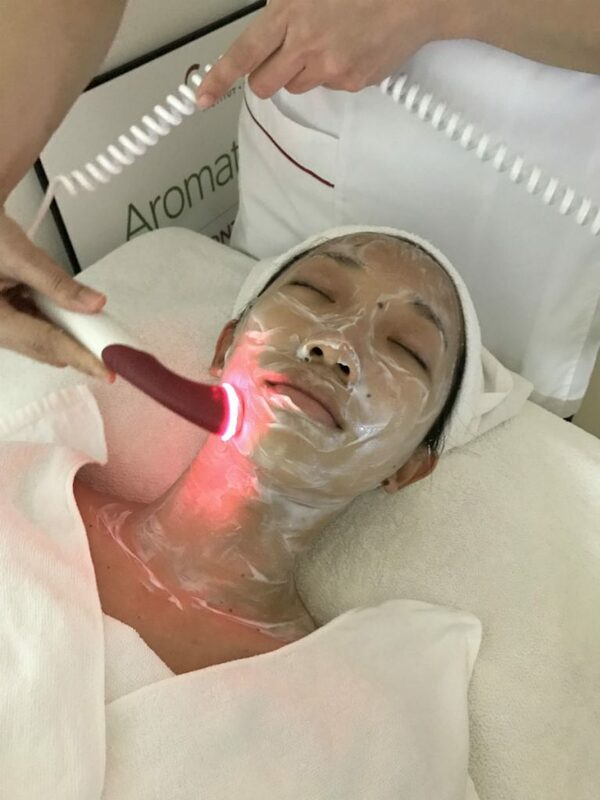 I did the Proionic facial treatment, which is designed to help lift the skin, making one look younger and more radiant. 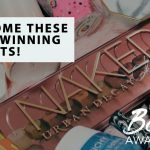 The secret of this award-winning facial is the unique patented 448kHz long-wave radio frequency that allows the ease of movement of ions through cell membranes and re-balances the skin’s ion level. It has anti-ageing effects as it enables more oxygen to enter skin cells and improve cell metabolism, thereby improving skin elasticity. The exchange of negative and positive ions also helps to balance skin’s sebum production over time. This non-invasive treatment is suitable for all ages and both genders. The Proionic treatment begins with a double-cleansing and exfoliation. Thereafter, the Indiba Capacitive Electrode is used for lymphatic drainage. Indiba Resistive Electrode was then used warm up skin’s temperature from within. This heat stimulates collagen production from the deeper layers of skin while repairing damaged collagen fibres at the same time. 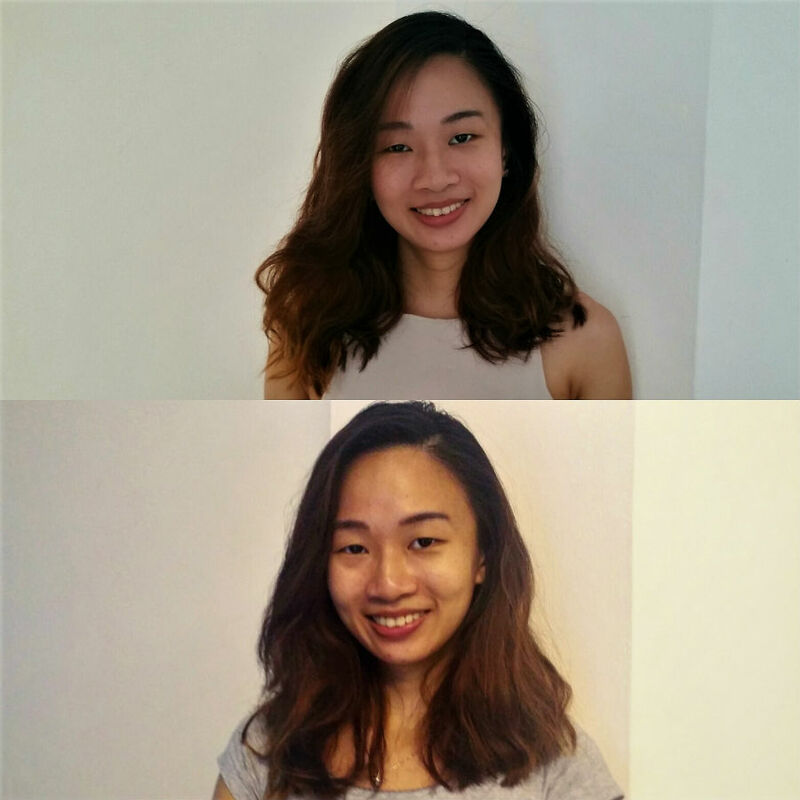 After doing half my face, she showed me the difference between the two sides and I could see a visible difference in my face shape! The area that she had done the treatment on looked much more lifted and plump. To complete the relaxing experience, an enjoyable thermal facial massage and a relaxing shoulder massage were done. Finally, the soothing Hydrocare Bio-Cellulose Mask is applied to reduce post-facial redness. This mask is formulated with a powerful blend of natural ingredients like Litchi Seed Extract to fight free radicals and boost collagen production, Cactus Extract to soothe, hydrate and prevent inflammation, as well as Fig Fruit Extract, which clarifies skin and is rich in Vitamin A for anti-ageing benefits. The mask also contains Sodium Hyaluronate and Ceramide, which helps to deeply moisturise skin. It also doubles up as an eye mask to prevent puffiness and reverse signs of ageing. 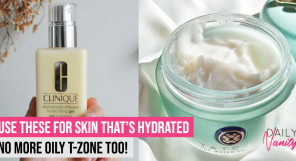 This mask provides the perfect hydration boost needed! This is a one-of-its-kind treatment that is pampering while it delivers desired results. I emerged from Porcelain with a sharper-looking jawline and smoother, glowing skin. Porcelain Aesthetics is located at Orchard Gateway #03-13. Call 6844-9660 to book an appointment or visit their website to find out more. 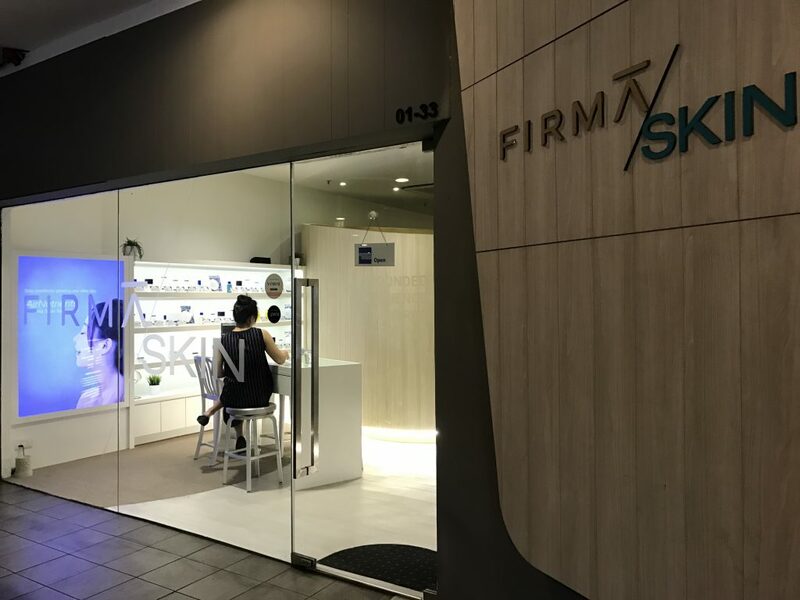 Locating Firma Skin facial salon was easier than I thought (right next to the Golden Shoe carpark gantry!) and it has a beautiful glass exterior that completely exposes its spacious and minimalist interior. My esthetician Kellyn, who was genuinely kind and clearly knowledgeable, handed me a detailed customer consultation form to fill in to find out more about my skin needs and concerns. How is anti-ageing facial done at Firma Skin? I did a treatment called the Firm & Lift, which features the use of radio frequency to deliver active anti-ageing ingredients deep into the skin to visibly improve its elasticity, diminish wrinkles, and leave it soft, supple, and smooth. This result apparently lasts for one week! Kellyn, my esthetician, skipped the exfoliation step on account of me having just had exfoliation done at a facial recently, and went straight into the machine treatment after gently double-cleansing my face with a collagen milk cleanser and then a papaya cleanser. A pen electrode extended from the machine is then being manoeuvred on my face that’s covered with a thin film of oil based Vitamin B5 serum (without any H2O content because electricity is involved). She explained that the electrode carries a current at radio frequency accompanied by gradually increasing heat that starts out at somewhere over 40 degrees Celsius. The heat is supposed to deliver mainly the Vitamin B5 in the serum directly into the second of three layers under the skin’s surface where collagen resides so as to enhance the production of collagen. She glided the pen on my face in an upward motion, lifting my skin as she went. The heat from the pen warmed up gradually but it was surprisingly very comfortable and soothing! And it’s like she was massaging my face with the pen as she was applying quite a bit of pressure scraping against my skin, so much that I could feel the muscles rolling underneath. The procedure was over too soon and I felt like I could do it forever. She layered a cool peel-off mask on my face and left the room and before long, I fell asleep. After what felt like 10 to 15 minutes, she came back and slowly peeled off the mask. By then my face already felt firm and light as if a whole year of dead skin and impurity build-up had been peeled off! What came next was entirely unexpected. Bird’s Nest Micro-Essence and AteloCollagen (soluble collagen) are being delivered into my skin via a technology called the AirNutrients, and all three are developed by Firma Skin scientists! 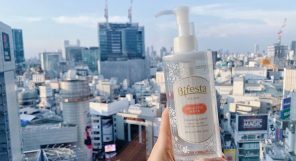 Basically, an equipment is filled with AteloCollagen and then Bird’s Nest Micro-Essence and delivers them one after the other into the skin in the form of a vaporous spray that feels like air! 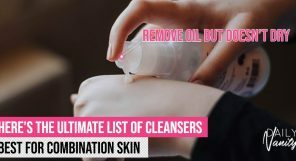 Kellyn explained that this method is superior to massaging with hands in penetrating the active ingredients into the skin because of the extremely fine streams of of vapor that fit comfortably through even our tiniest pores. Lastly, snail extract is applied to my face in the form light and thin film of serum that felt cool and super comfortable on my skin without smelling funny (like I thought it would). It’s supposed to improve the appearance of the skin by reducing fine lines and wrinkles and treat dryness and roughness. It also has healing effects on acne scars! This is easily one of the most pampering and effective anti-ageing facial I’ve done! The movements of my skin felt so much more agile and buoyant, and the baggage under my eyes were visibly lightened, such that my eyes look so much more awake. 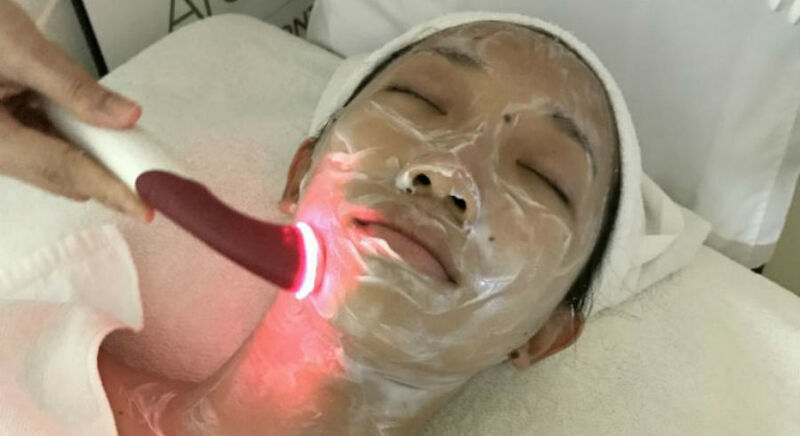 I really enjoyed the radio frequency treatment because the heat and pressure was not only comfortable, but felt like one of those traditional Chinese massages that leave you thoroughly relaxed. All facial treatments at Firma Skin is now available at just SGD68 (U.P. SGD120) till 28 Feb! 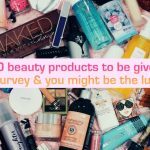 Click on this box for details! Their facial studio is located at #01-33 Golden Shoe Car Park (next to the carpark gantry). Call 6557-4253 to book an appointment or go on their website to find out more. 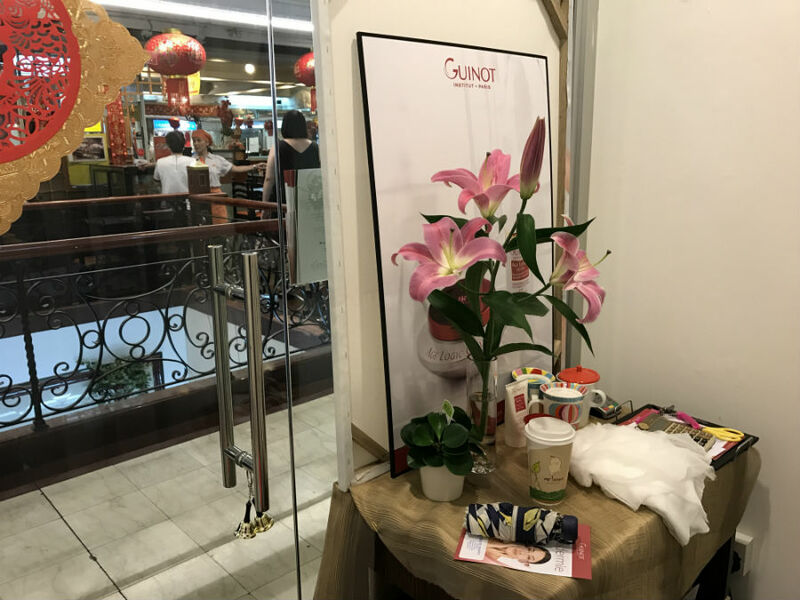 Beaute Essence is an unassumingly charming facial salon situated among unrelated shops along the third level of the Arcade (right outside Raffles Place MRT station). 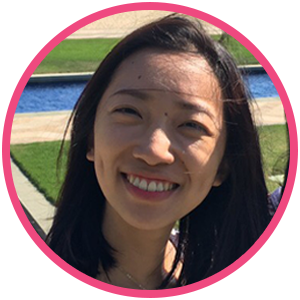 The owner of the salon, also its only esthetician, Jan Yap, has been in practice for over a decade and specialises in leading French professional skin care brand Guinot’s products, methods, and technologies. 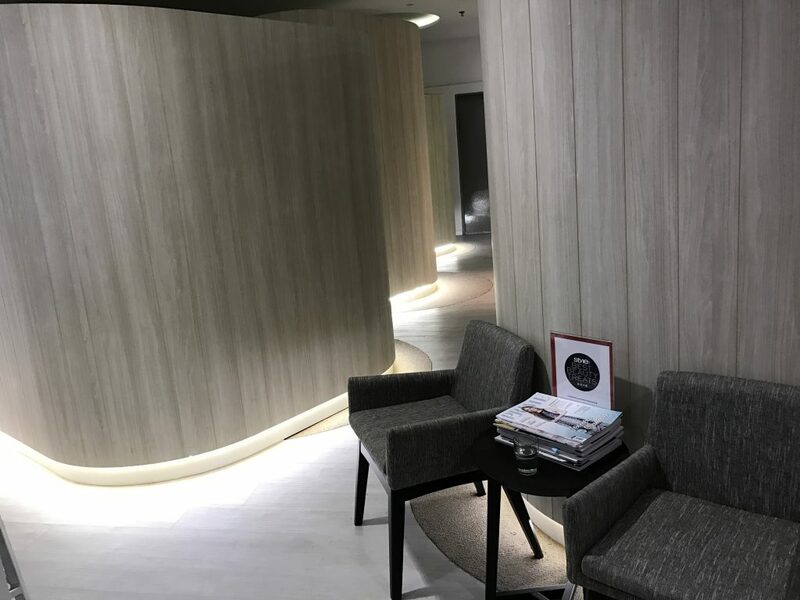 The cosy entrance area leads to two facial treatment rooms partitioned by sliding doors and translucent flaps. The salon is lit with a warm glow and the soothing guitar sounds of Cavatina was playing through the speakers. After filling out a customer consultation form, I got changed and settled into the facial bed. 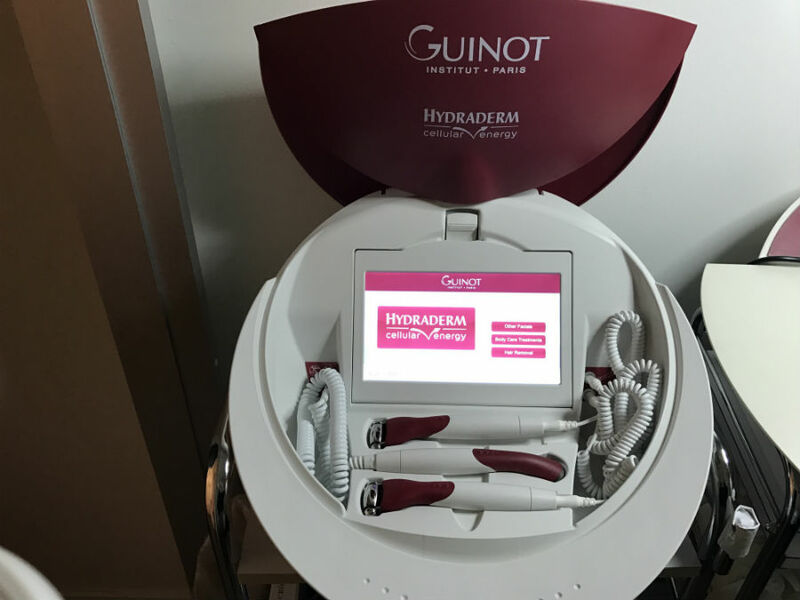 I got to experience French brand Guinot’s new fifth generation machine, a pod that houses three electrodes. It is a painless, effective, and long-term alternative to aesthetic medicine in the field of anti-ageing. 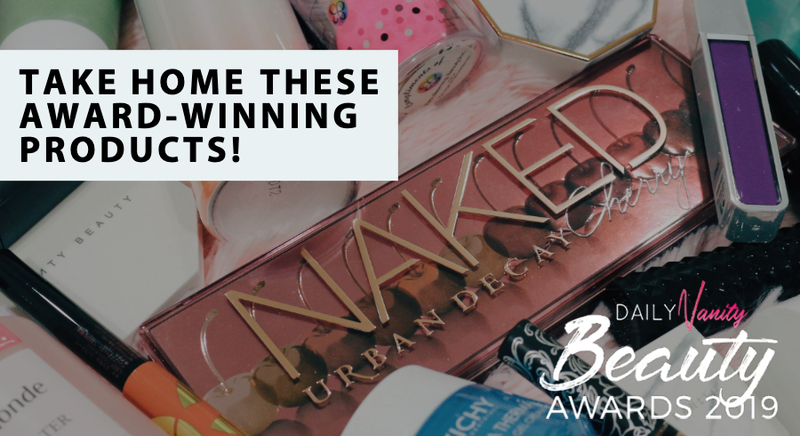 It focuses on the stimulation of our skin’s cellular activity to retard the effects of aging, whereas aesthetic medicine such as botox and fillers involves invasive surgery that gives short-term results. How is the anti-ageing facial done at Beaute Essence? After gently cleansing and exfoliating my face, Jan assessed my skin condition and chose the facial serum that best suits my skin. She slathered the cool serum on my face, which felt very soothing, then proceeded to use a massage roller electrode to gently and sequentially massage the serum into my skin from the neck (where the first signs of ageing typically surface) up to the face. At areas of my face with more nerves I felt very mild tingling sensations. She explained that it’s normal because the electrodes release an electric current and via a process called dynamic ionisation increases skin cell activity and accelerates absorption of the serum. I loved how cool and relaxing the metal rollers felt on my skin! She then applied an oxygenating cream on my face. By now I had gotten used to the feeling of foreign devices on my skin so when she switched to a different electrode and I welcomed it. This time the electrode was warm, and also manoeuvred in gliding motions all over my neck and face. I was told that this is a thermal electrode that eases the oxygenating cream into my skin, delivering oxygen into skin cells and hence improving the skin’s self-healing function and overall radiance. There were no tingling sensations this time, just calming warmth. Before we moved on to the next step, Jan asked me for my age. When I said 25, she suggested giving me a lifting treatment before concluding with the relaxing massage. It started off with an anti-ageing drainage which involved the use of drainage electrodes to relieve tension in the skin. Next came the fun part – muscle stimulation! Apparently, it’s like a workout at the gym for your facial muscles. As the electrodes are rolled over your neck and face releasing a strong but safe current, the muscles underneath get the exercise they haven’t gotten in years, which means our skin gets fitter! I was warned beforehand that this particular stimulation was going to make my face do funny expressions whenever the electrode rolls over bundles of nerves and I braced myself for it. What happened was that my muscles twitched and stretched where there are more nerves, causing my features to move on their own! She ended off the session with a head and shoulders massage before applying a cool mask on my face. I was pleasantly surprised at how effective the treatment was at improving the firmness and radiance of my skin after just one session. 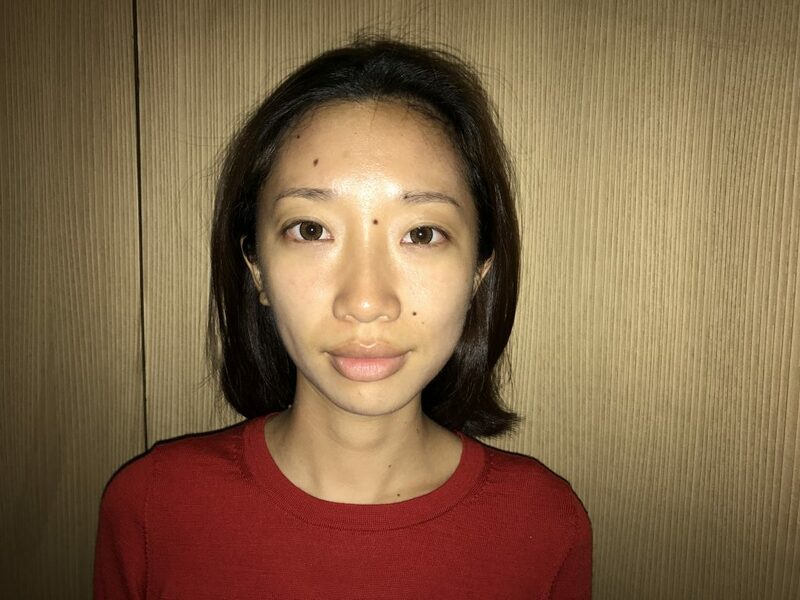 As can be seen from the picture of my face after undergoing muscle stimulation on one side, the difference is obvious in a subtle and very natural way! I thought to myself, “So this is what my face used to look like when I was younger!” Due to the stimulation and rejuvenation of my skin cells and muscles, my face felt revived from within and gained back several years. 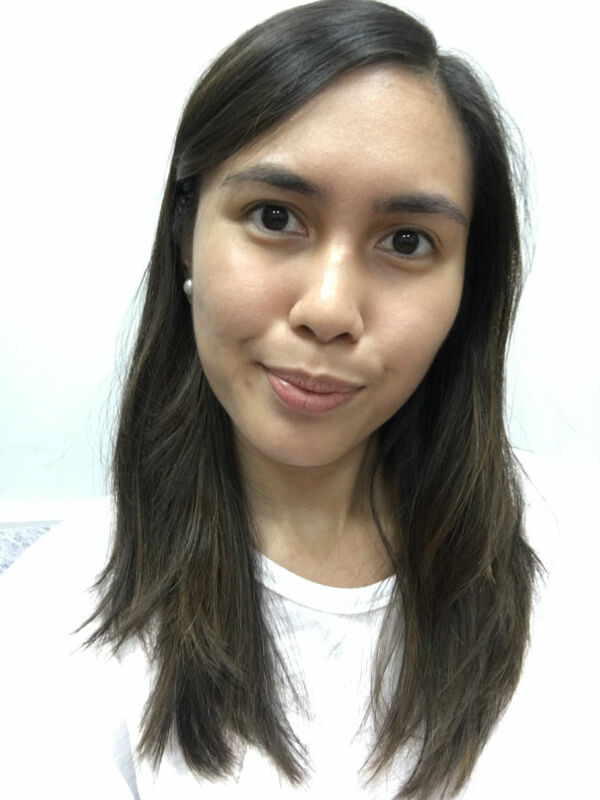 My eye bags looked less saggy, smile lines and crow’s feet less deep, and my skin radiant, supple, and firm. I also felt unexpectedly pampered by the post-treatment face-neck-shoulders massage that was better than many professional massages I’ve had! Beaute Essence is located at The Arcade #03-07B. Call 8180-1812 to make an appointment or visit their Facebook page to find out more. 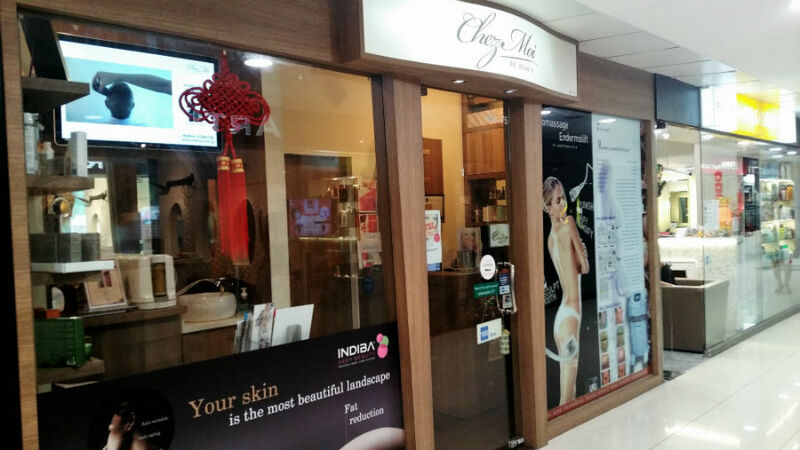 Amidst numerous beauty parlours in Far East Plaza, Chez Moi De Beaute stands out as a cosy boutique that offers easy-going services. Chez Moi De Beaute (chay-mua-dee-boat-ay) may not be huge, but it carries a wide range of facial and body services including extraction facials and slimming massages. Chez Moi De Beaute is best known for its comfortable ambience, polite and knowledgeable staff, and its INDIBA Proionic Rejuvenation treatment, which I tried. I was warmly welcomed by the manager, Hui Jia and my therapist, Nico. Having assessed my day-to-day activities, I was told that I had combination skin which might age more rapidly because I go out in the sun a lot and UV rays had a huge impact on my skin. While I am still in my 20s, it is never too early to start caring for my aesthetic health. I had a few pimples on my chin and my forehead from lack of sleep and stress. Thus, Nico decided to extract them first. After applying a papaya softening gel to ‘open’ up the pores, she began extracting my huge pimples and blackheads. Surprisingly, pain was minimal! Afterward, she applied a cooling serum made of aloe vera to reduce the redness. How is the anti-ageing facial done at Chez Moi De Beaute? After the extraction, I was introduced to a machine called the INDIBA Proionic System that used a patented radio frequency of 448kHz to boost collagen development by facilitating ion exchange and equalling the electrical potential of bodily tissues. I had never heard of INDIBA Proionic Treatment before so Nicole provided me timely explanations throughout the procedure. The INDIBA Proionic System combined non-thermal, thermal and hyperthermia effects to improve biological processes. 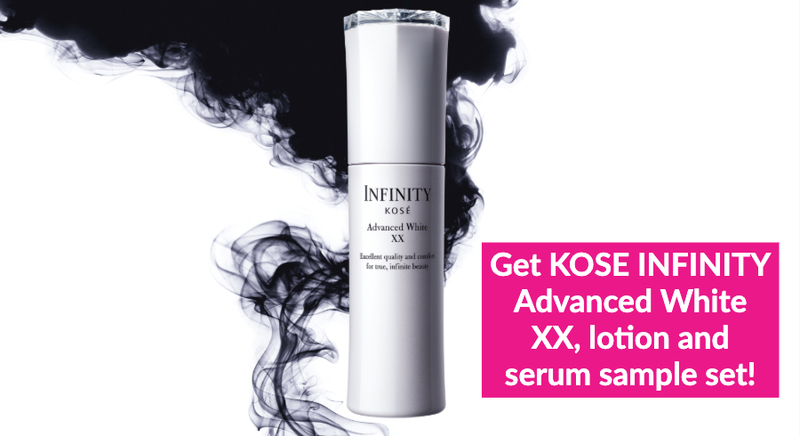 In the long run, this would re-balance cell function, improve microcirculation and stimulate collagen production for firmer, healthier, and more youthful skin. For people with combination skin, the Proionic System reduces sebum production and reduces shines. Nico began the INDIBA therapy by massaging my neck with her hand and the node of the Proionic System and slowly worked her way to my left cheek and then my forehead. I was amazed by the suppleness and the slight lift of my left cheek (see below, left). Thereafter, Nico proceeded to apply the treatment to the rest of my face. The final effects of the treatment are on the right (see below). After the treatment was over, Nico applied a peel-off mask before giving me a shoulder and neck massage. Finally, she peeled off the mask and applied a soothing toner, non-greasy moisturiser and a primer-and-sunblock to protect my skin from the harmful UV rays. Above: Before facial. After: A few days after facial. Generally, I was very pleased with the results (that I even took an “after” photo with no makeup at all!) In spite of my age, the effects of the INDIBA Proionic treatment was evident. I was taken aback by the plumpness and radiance of my skin. Furthermore, my scars were less red than usual and my face felt “lighter” and smoother because all the gunk and sebum had been removed from my clogged pores. Moreover, my cheeks received a massive lift and my chin looked sharper – which made my face look slimmer, yet healthier. But the one thing that really impressed me was how knowledgeable and bubbly the staff at Chez Moi are. 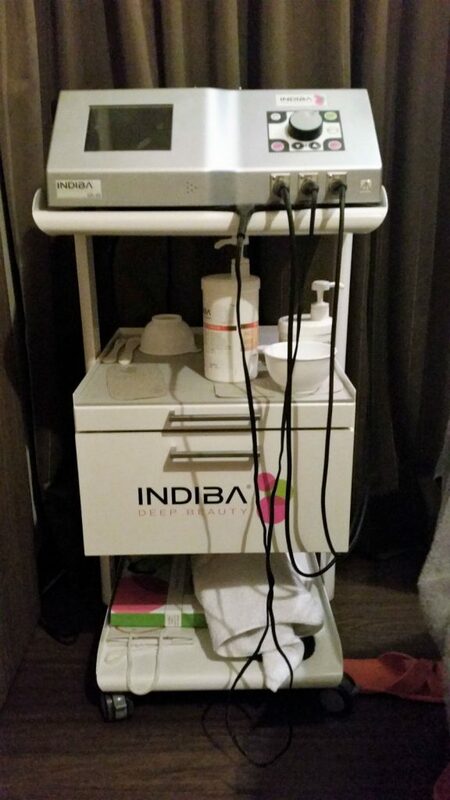 HuiJia gave me a comprehensive assessment of the INDIBA Proionic treatment and entertained all my curious questions. She definitely reassured me of my apprehension towards a treatment I’ve never heard of before. Likewise, Nico was friendly and professional! Her expertise in beauty and aesthetics was clearly evident. She was extremely knowledgeable and patient while she explained the effects of the treatment and assessed my skin. Nico and Hui Jia definitely made the experience a truly relaxing one. I really appreciated the cosiness and hospitality of the salon and its staff. 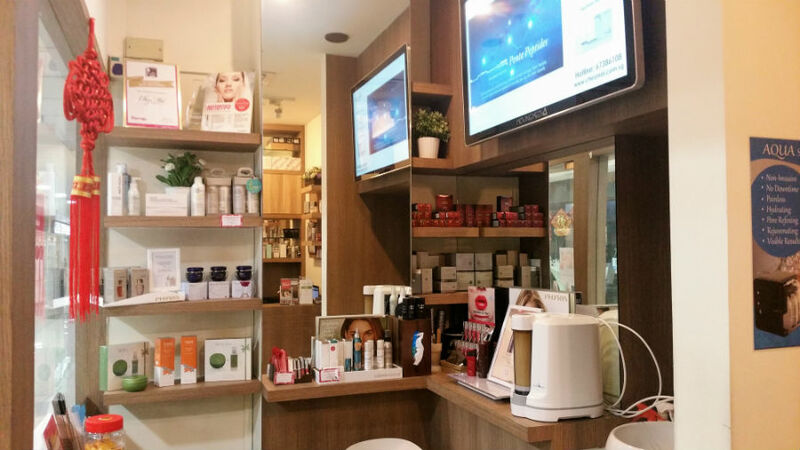 Chez Moi De Beaute is located at #04-75 Far East Plaza (a short walk from Orchard MRT). Call 6738-6108 for appointments, or visit their website for more information. The salon exudes luxuriance from the moment you step into the reception area, with velvet cushioned arm chairs and a classic Baroque interior design. The manager, Eve, was very approachable and explained the process of the facial in detail, helping you feel at ease before I began my facial. I went through the Nutri-Rich Caviar Firmness & Radiance Treatment, which is meant for ageing skin. This treatment is especially effective for women in their 40s or 50s as mature skin requires more preventive treatment and management, but it is also suitable for younger women (typically 30 and above) whose faces are already showing signs of premature ageing due to environmental factors, diet, and stress. One of their best-selling treatments, the caviar treatment is meant to counter signs of ageing from as early as 25 years old to the more mature stages! Post-treatment, the skin should look rosier and plumper, and sagging areas appear fuller. The package type in Le Facialle is very flexible – you pay a certain amount, and enjoy a discounted rate for the types of facials you choose each session. Depending on the facialist’s assessment of your skin before every session, they will give some recommendations from the wide variety of facials that they offer at the spa, so that your skin receives the most suitable type of treatment each time you visit. You should be able to see some visible results after each session. 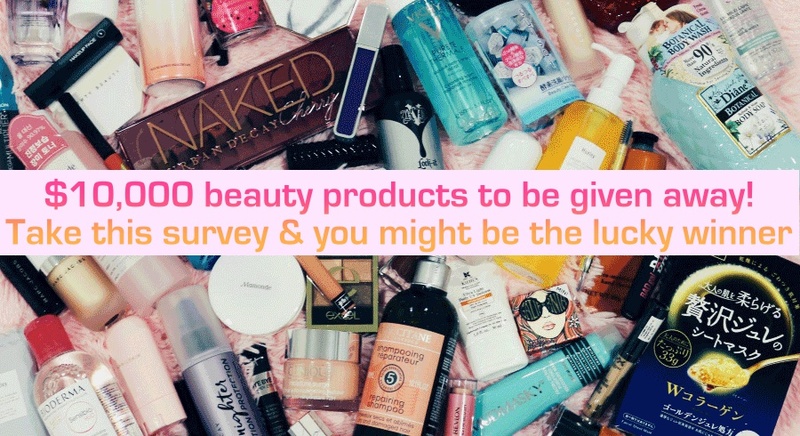 The skincare products used are mainly Declare from Switzerland and Gatineau from Paris amongst other European brands. 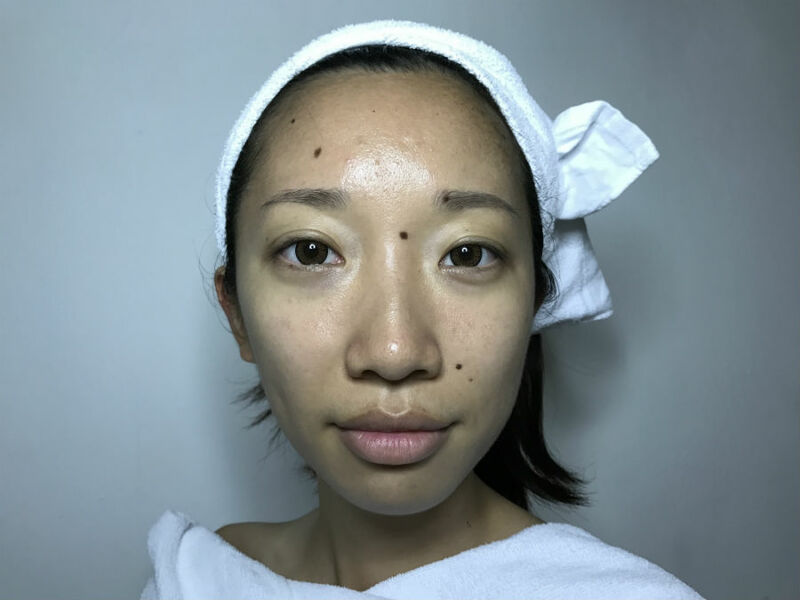 During the pre-facial assessment, my friendly facialist Chloe identified my skin to be of the dry sort, which may be sensitive and prone to irritation. I confessed that I had not been using my moisturiser as much as I should be. How is the anti-ageing facial done at Le Facialle? The session began with a relaxing facial massage, followed by double-cleansing with moisturising cleansing milk. Because Chloe had already seen that my skin was dry, she decided to only put me under the steamer for two minutes, as she didn’t want to dry my skin out that much. Exfoliation was also done with their sensitive skin range which would lessen any moisture stripped off the skin. In my case, they deemed it necessary to do some basic extraction, so a pre-extraction anti-irritation serum was applied to reduce redness and inflammation. Extraction was done expertly by Chloe. Despite my low pain threshold, at no point during the process did I feel like telling her that it was too painful for me. It was even, dare I say it, enjoyable. 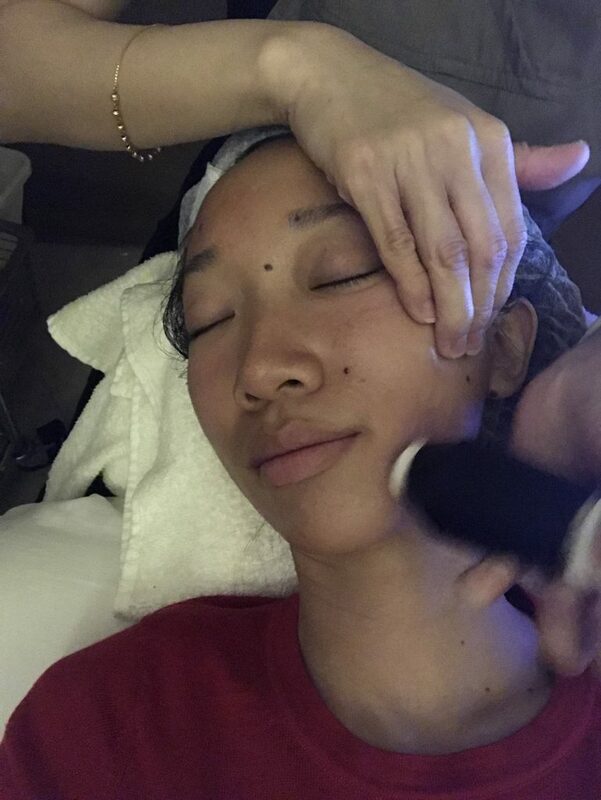 Granted this was a very basic extraction and she probably held back quite a bit from irritating my skin just before Chinese New Year, but it left a favourable impression on me. During this time, Chloe also helped me to tweeze and neaten my eyebrows. 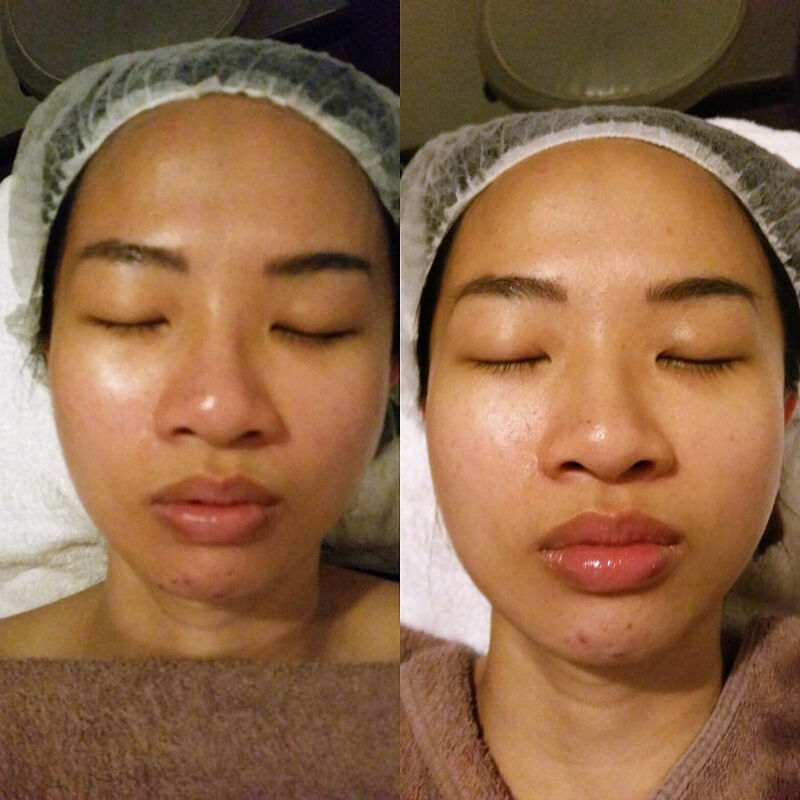 A post-extraction serum was applied to soothe the skin after the extraction was complete. Another facial massage was done. I loved these facial massages, as they were done with just the right pressure to be relaxing without being overly painful. Next came the highlight of the treatment: the intensive Caviar ampoule with the Transport Fluid formulated by Declare. Being an expensive delicacy, it should come as no surprise that caviar is rich in vitamins A, D, B and other amino acids, and has been claimed to speed up the skin’s production of collagen, which promotes better elasticity and younger-looking skin. This Transport Fluid works to transport the nutritious ingredients of the caviar directly into the skin, increasing the speed and efficacy of absorption. Next came an eye and shoulder massage which was done with glass balls. At this point, I was feeling very drowsy and so I only remember the coolness of the glass being very soothing on the skin. I enjoyed Le Facialle’s best-selling mask, the Deep Impact Mask. This mask is said to be able to further calm the skin, reduce redness, and even whiten and moisturise the skin layer. By the time this mask was applied, I was already fast asleep. I enjoyed Chloe’s gentle but firm hand during the facial, and appreciated that she was always informing me what she was next applying. Everything during the Le Facialle process was done by hand, without any machines (besides the steamer). 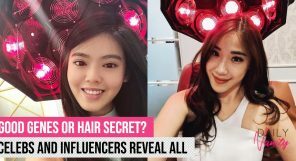 Chloe was always checking with me whether I felt too uncomfortable during the extraction process, and also gave me various tips on how to improve my dry skin at home. Overall, the experience at Le Facialle was extremely enjoyable and relaxing. The atmosphere in the centre, reflected through their interior design as well as the style of their facials, was luxuriance without superfluity. 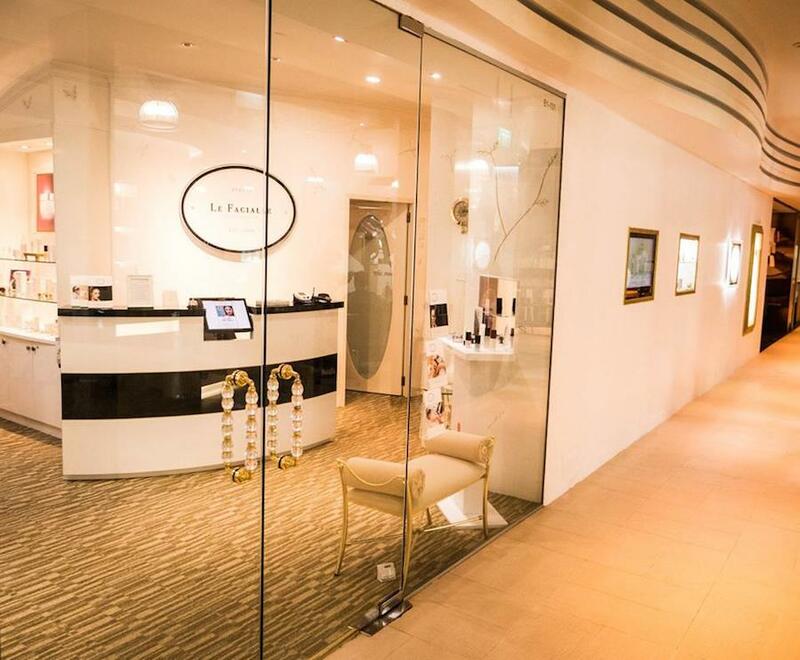 Le Facialle is located at 10 Sinaran Drive, Square 2 #B1-101/104 (near Novena MRT station). Visit their website to find out more or call 6732-3839 to make an appointment. Click to the next page to see more recommendations and reviews.